Communications Strategy & Consulting | Vincent Associates Inc.
Fast, flexible, cost-efficient client communications. Leverage your customer data into an effective communications strategy! Since 1995, Vincent Associates has been helping clients turn this often hidden resource into marketing gold. We’ll show you how to create highly effective digital and conventional mail communications campaigns to support your CRM and marketing objectives. Email communication is an integral part of any marketing campaign. Vincent Associates’ team of experts and in-house designers will work with you to generate compelling emails, designed to grab maximum attention and deliver maximum response. We never use templates. Every email we design is customized to support and enhance your brand, differentiate you from your competitors and generate the desired response objectives – whether it’s click-throughs to a splash page, demographic data gathering or sales promotion. Email can play a key role in your client communication strategy. 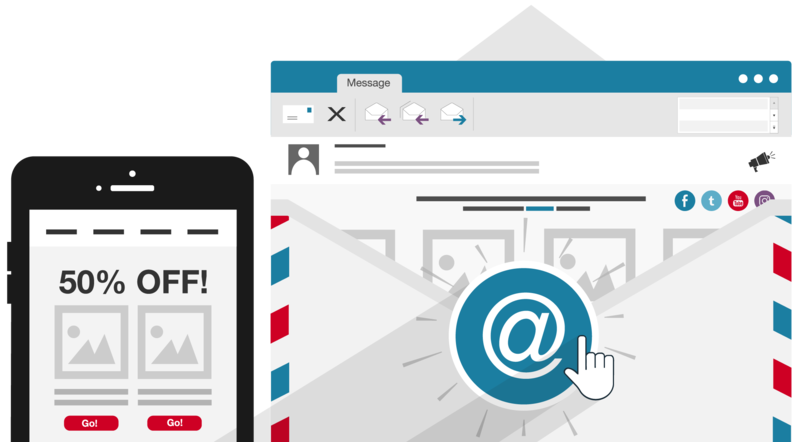 Successfully deploying and managing your email campaigns can boost your business and help you reach your customers more effectively. Vincent Associates has substantial experience in the deployment and management of mass email campaigns. Ensuring the lowest number of bouncebacks and highest open rates are just two areas of our expertise. Our secure emailing process is fully compliant with current privacy legislation and policies, including Canadian Anti-Spam Legislation (CASL). A critical element in determining the success of an email campaign is the analysis of the results. At Vincent Associates, we strive to identify value for our clients. With a proven history of email design, deployment and back-end analysis, we accumulate data and provide feedback on the important metrics of each email deployment. Our solution tracks the success of each campaign side-by-side. This allows you to develop a deep understanding of your clients’ behavior, interests and motivations and helps to identify the aspects of your campaign that worked best. The results are then used to further refine and more effectively target your next campaign. While digital communications form the backbone of today’s marketing strategies, direct mail still offers an effective and tested method of reaching target demographic groups. Applying cutting edge data management tools, advanced digital list selection techniques and state-of-the-art lettershop services can create the biggest bang for your direct mail buck. At Vincent Associates, we offer top-shelf direct mail and lettershop services that can coordinate with and enhance your internet, social media and email communication efforts. We are well versed and compliant with all Canada Post rules and regulations. Our highly experienced and professional translation department can translate your Web site, marketing and advertising material and complex documents for all types of products, services and industries.